He celebrated ten years of active poetry performance in Ghana not long ago with an experience and resume season two of his weekly poetry event “The Rhyme Show”. Rhymesonny has graced great high profile events in Ghana and the UK this year and couldn’t end the year better than giving the world a part of his heart. 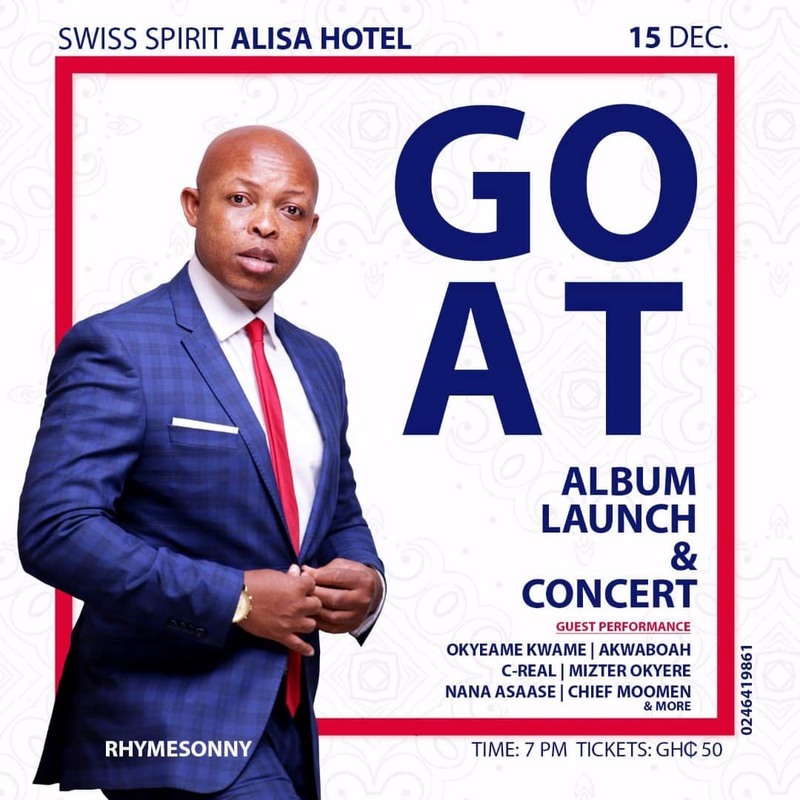 Rhymesonny is on the verge of releasing his much anticipated studio album “G.O.A.T” (Greatest Of All Times), a collection of his great poetry compositions that are centered on religion, politics, love and social issues. The 22 track album heavily draws inspiration from his immediate surroundings, beliefs, experiences, cultural influences and imaginations all blended together into an interesting fusion of art and promises to take on contemporary ideologies with the power of words. The track list includes Sun & Son, G.O.A.T, True Friend, Rolls Royce Phantom, Made In Ghana, Passion Of Christ, Letter To The Church, Amasaah Boateng, NERD, and I Am Music. The tracks have been beautifully laid on an asphalt of creative music melodies scored by 10 skillful sound engineers in Ghana. The launch of the album will be accompanied by a media tour and major launch concert with the Safoa Band and many other surprise artistes. Swiss Spirit Alisa Hotel in the heart of the capital play host to this incredible event on the 15th of December and promises to be one of the best alternative events to happen this festive season. The G.O.A.T album launch is heavily supported by Abeiku Santana’s Kaya Tours, Nallem Clothing. Humano Energy, Riohs Originate, the Despite Group, Hitz Fm, Joy Fm, Nkonkonsa Gh, Zylofon Media, Graphic Showbiz, Ghanaweb, Zionfelix.com, Blagogee, Enews Gh, Writers Project Ghana, Rob Photography and a host media.